The post I linked above imagines a judgement day conversation in which a liberal defends his parsimony to God on that grounds that he supported politicians who promised to redistribute wealth to the poor. Wasn't that charity enough? No, says God, who expresses disappointment that he chose to waste time on selfish pursuits instead of engaging in truly charitable acts. Forcing charity on others is no substitute. It's a very damning indictment, and as far as it goes, I totally agree. Nobody should feel justified taking credit for the contributions of others, whether compulsory or voluntary. Charity, in the sense of donating one's own time, talents, and energy, in service of others, is an individual responsibility that cannot be outsourced or voted into another's care. God's purpose is to lead his children toward salvation through belief in him and following his commandments, including the requirement caring for each other, the basis of charity. Government's purpose is more mundane: to keep society organized. From a religious perspective, problems only occur when the latter interferes with the former. God has dealt with every form of government imaginable, from monarchy and despotism to republicanism and democracy, yet the only governments that come under condemnation are ones that suppress belief, persecute believers, or encourage believers to disregard God's commandments. To the extent God works through secular government--which is always tricky to prove--it is to achieve his larger purposes, which transcend the government itself. Government focuses squarely on everyday, plain ol' life on earth. Some governments do it more effectively than others, and the differences can make a big difference in how a society functions. The nice thing about democracy is that it gives everyday folks like me a voice in how Caesar's things get rendered: since I have a say in government, Caesar's stuff is partially my stuff. In the case of welfare, it means I can vote for government to guarantee certain basic standards of living for all citizens, which, I think, ultimately benefits everybody in society. Reducing income inequality also minimizes social unrest and improves quality of life. Charity, frankly, has little to do with it. It doesn't matter if taxes are paid happily or grudgingly, because the outcome is what's important. If you want a different outcome or better administration of it, you can vote for Caesar to render stuff differently. Individual acts of charity, which is what matters for the religious, are still possible regardless of any government policy. The important thing is that these policy disputes are rooted firmly in the the everyday, the earthly. They are not part of the cosmic battle between good and evil; God has more important things to worry about than unemployment benefits and tax rates. If government starts suppressing (or mandating) religious activities then we've got a problem and I'll be the first to protest. 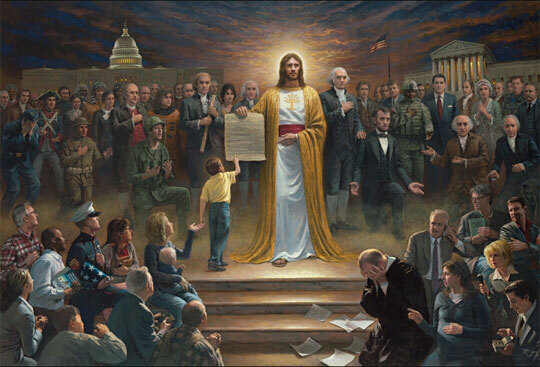 In Jesus' day, many of his followers were disappointed that he was no political revolutionary against the oppressive Romans, but Jesus understood and taught the proper relationship between God and government. Religious liberals can be guilty as well. How often have you heard a liberal accuse religious conservatives of being heartless, uncaring, or hypocritical because they oppose welfare programs? But if Christianity does not forbid government welfare, then it does not compel it either, and claiming that someone is unchristian for opposing welfare is both flawed and counter-productive. It offends conservatives who see themselves as very charitable individuals and stirs resentfulness and anger in a rhetorical race to the bottom. I believe conservatives have some very reasonable criticisms of government welfare, such as the fear that it rewards those who refuse to work at the expense of those who do. How to deal with that, however, is a temporal matter, an earthly thing. If I accuse someone of being evil or uncaring because they have such concerns, it only poisons the debate. Heck, even if they are actually selfish, I have no right to judge them. Doing so demeans God's purposes and drags him down into the mud with the rest of us. It's okay to feel passionate about earthly things, and if possible, try to change them for the better. I can't imagine living under a system of government where the possibility is out of the question, even if that accounts for most of human history. But that passion means disagreement, and it's arrogant to think that my opinions, full of biases and imperfections as they are, just happen to align with God's eternal will. For religious people today, we should always think twice about dragging God into temporal politics. Doing so puts us at risk of assuming that God's thoughts are our thoughts, that his ways are our ways, and that those who disagree with us are enemies of God. Although it's easy to fall into that trap, it's not a judgement I'm comfortable making about someone else, and I hope people aren't making it about me. 1) Casey and i agree on a lot. Forcing others' charity using your vote does not constitute charity. Welcome to our little corner of the internet! You make a fair point: I used your post primarily as a launching pad to talk about what I wanted to talk about rather than respond to you directly, and I think on the basic points of what you said we're in substantial agreement. Others have made similar arguments more, shall we say, forcefully, going so far as to practically call Mormons like me apostate for my political beliefs, so those uncited folks certainly colored what I wrote, along with cringeworthy comments people on "my" side occasionally make. I just wish that religious people, LDS and otherwise, would be less eager to claim that God is on their side in political arguments, although I've been guilty of doing so myself in order to bolster moral credentials for this or that position. It's just so tempting when God is the ultimate moral trump card! I very much agree that government programs and charitable organizations are not meant to do the same thing. Ideally they work together well, and are able to feed people on many levels. I am always bothered when people say something equivalent to; "Government shouldn't be doing social welfare because they don't do it well. The LDS church does a much better job at teaching people to be self sufficient, and we should get government out of the way so that God's model can be put into greater use." I think this post does a good job of explaining the differences between our responsibilities to be charitable, seperate from how we think political authorities should administer government resources and policy. I will post the comment I left on Michael's original post. There is one part of your post that bothers me, simply because it isn't true. You say, "The church has a much better system set up for doing so.” The church has a supplement to the government assistance programs, but in no way is it a replacement for government program. Each bishop we sat down with, (including the bishop in Utah when I was fired from being a nanny because my son was a patient at Primary Children's Hospital, and our housing was with the family I was nannying for, so everything got moved out of their house while I was with my son at the hospital) wanted to make a budget with us, and the amounts we were or should be getting from government assistance programs were definitely part of it. Most of the time, the major help we received from the church was a stop gap to help us until we had our applications for unemployment and Medicaud were approved, or when I was in school, until the next time that financial aid was able to be increased to include the maximum amount of loans. So, if you mean "teaching" a fishing lesson to be how to apply for government assistance and to help members not be evicted before that aid is received, then yes, the church does teach members how to be efficient in obtaining help from government programs. Most of the help I have had or I have seen provided for friends, is the church providing food and some short term help if you make too much to qualify for food stamps. If you mean that the church has a good system for helping members access all of the government programs in their area, that they might not know about, then I agree that the church does a good job helping its members. If you mean that the church has a program that replaces government programs, or that it keeps church members from using government programs, then you are not dealing with the reality of how poor church members cobble together church and government help." Great post. It made me consider how many times I've injected God into discussions where I really had no right to, which in turn made me think of the episode of King of the Hill where Bobby joins a Christian youth group and Hank confronts their pastor. Pastor K: Don't you think Jesus is right here on this half-pipe? Hank: I'm sure He's a lot of places he'd rather not be.